I am in no way “anti-machine.” I have them. I like them, especially the ones that work well (I will write later this week about two old gems rediscovered). But, I am not bound by them. Consider the following sensory observations. Aural – when working with machinery, my hearing sense is dulled to almost nothing due to wearing the protective muffs or ear plugs. 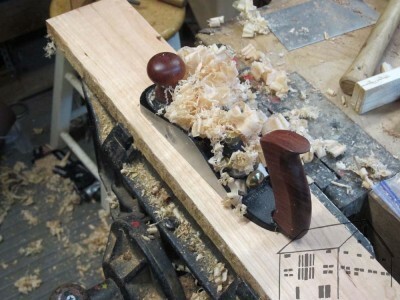 When working by hand, not only is there not the exhausting whine of the machine and the sense of isolation imposed by the protection, you can both enjoy the aural surroundings, like listening to music, podcasts, or simply enjoying the relative silence, there is the added delight of the sound of a well-tuned tool fashioning the wooden component. Further, these sounds are vital feedback to the work itself. Touch – When using machines I often wear gloves to keep from picking up splinters. Not while using the table saw, but certainly in material handling attendant to mass processing. Even if not wearing the gloves, I get little useful information from my sense of touch while working with machines. Conversely, my fingertips are a non-stop feedback loop when holding a hand tool. 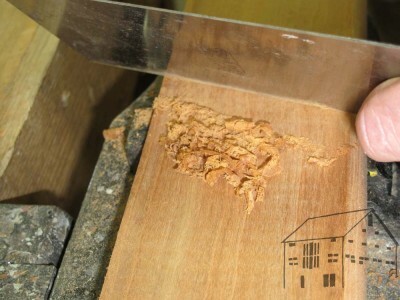 Smell and Taste – When working by hand, the gentle aromas, or even cloying stink, of the wood is released through the shaving or sawing with sharp tools. Whether I enjoy these fragrances, I can at least notice them. With machines, alongside my hearing protection I generally wear respiratory protection because the waste product is fundamentally different and must be dealt with more aggressively. Ultra fine sanding or power-sawing dust can be aspired efficiently, while a plane shaving requires a lot more effort to breathe in. Even with a protective particle mask, many an evening after machine work is spend blowing brown goo out of your nose. I cannot recall any tales of someone needing to evacuate a nice curly shaving from their head orifices, but my experiences are definitely finite. And the bitter taste of cypress dust in the mouth takes a lot of expectoration to purge from the taste buds. Sight – A lot of this is the result of the amount of money Blue Cross/Blue Shield and I have invested in my very “at risk” eyeballs. When using machines, I wrap those puppies behind layers of isolating protection. Not so much as to obscure my work and make it more dangerous, but certainly enough to remove any sense of visual intimacy. Further, when using machines I cannot observe the work occurring, I can only observe the result. By hand? A totally different game. I can actually see what is going on, in part because I have a different protective set-up (polycarbonate safety glasses vs. goggles and full coverage face shield), I can observe the edge of the tool on the work piece, and the rate of the work is slow enough to actually observe. Just some cogitations on a snowy day.